MIDD Volleyball 2017-18: Blast from the past, plus a look into the future in Denver! Blast from the past, plus a look into the future in Denver! I recently attended the Colorado Crossroads National Qualifier Volleyball Tournament, and not only got to see many talented young players, but also one who's been at MIDD, and one who's coming to MIDD. Incoming freshman Becca was there playing with her Encore Team from CA, and would-be senior Courtney was there coaching her CVA Team from CO. I enjoyed seeing Becca play, and will look forward to seeing a lot more of her over the next four years at MIDD. 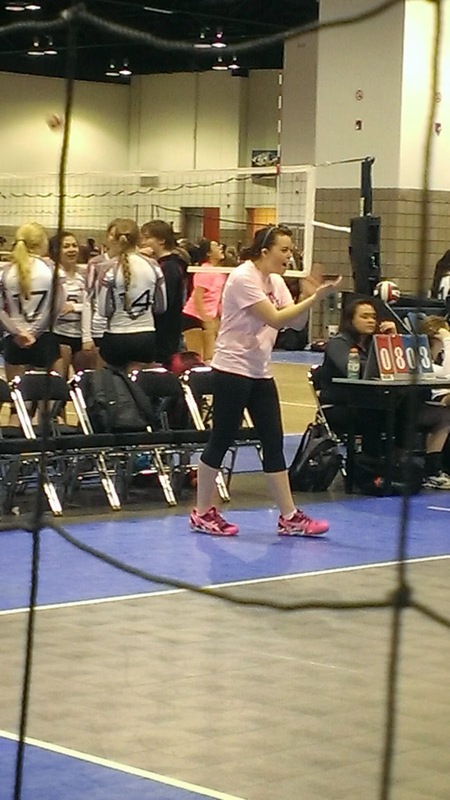 Court is enjoying her second year coaching club, while finishing her final year of college. She was there with her parents, Emma, and her boyfriend. Court will graduate this Spring and will pursue both an MD, and a PHD. She's currently interviewing, and has some very exciting opportunities, so it'll be great fun to keep track of where she ends up next year. 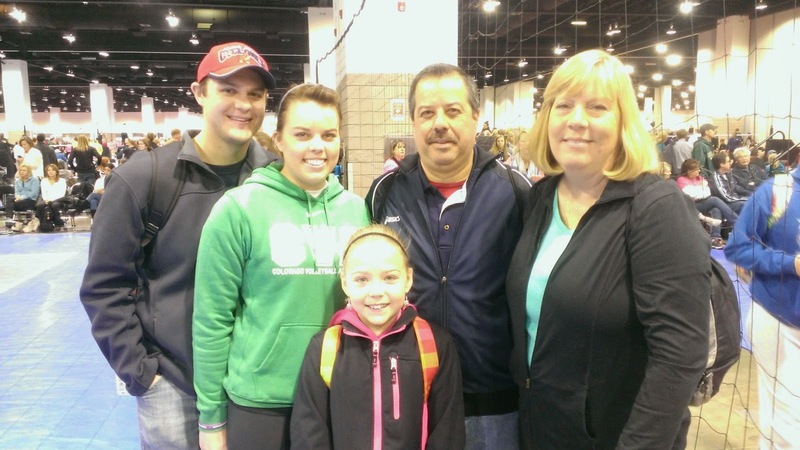 Emma is doing fantastic! She looks great, her hair has all grown back, is back in school, and seems to be leading a normal life, mostly cancer-free now! It's a miracle! She absolutely adores Courtney, which I knew, but I got to see it first hand this time, and how fun that was to see. Both Courtney's parents look great, and treated me to lunch, so a huge thank you to both of them. I had a fabulous time catching up with Court, and starting to get to know both Emma and Ryan. Becca--I was going to take a photo of you at the tournament for this Blog entry, but when I didn't take it the first time I saw you, I didn't want to stalk you by coming back by to take your picture. I still have the picture your dad sent me of your first recruiting trip that I'll include right here, just for fun! Keep up the great work Becca and Courtney! I'm also attaching a couple of pictures here of the Spring Blizzard that we had right as I was trying to get out to Denver. I'm happy that I was only delayed by one day after seeing the snowfall and drifting we had. The storm dropped 2 feet of snow, and the wind created drifts that were so big the plow truck couldn't get through them. 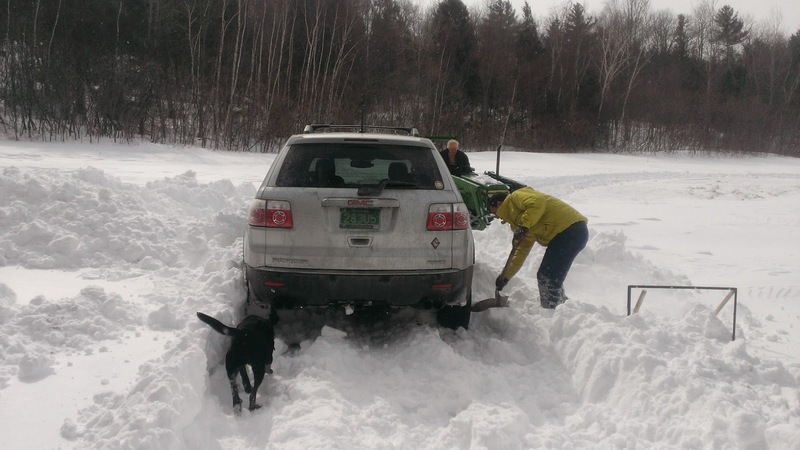 The first run through on our driveway was with a tractor, but unfortunately, the path wasn't quite wide enough for my car. I did finally make my plane, however, but not with much time to spare. 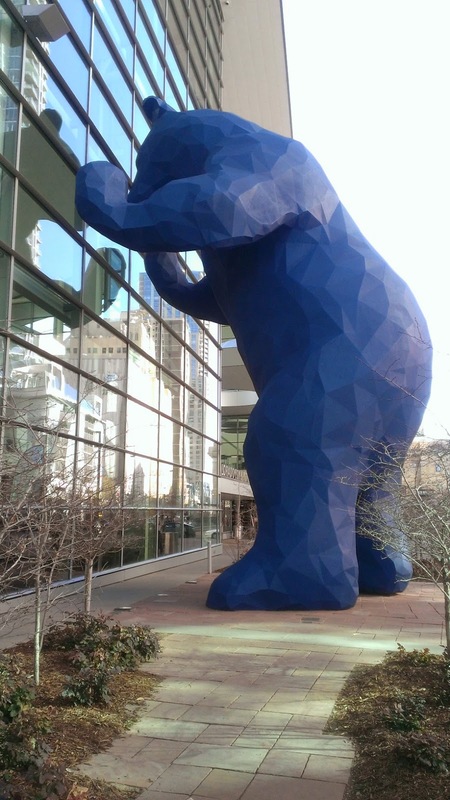 This big blue bear is outside the Convention Center in Denver where the tournament was. Very fun!